New York : Thomas Dunne Books, 1999. Twenty-eight-year-old Milly, preparing to marry the man of her dreams and trying to cope with family problems, worries that her day will be ruined by the revelation that she had married a homosexual man ten years earlier in order to help him stay in the country. 100 ME:PersonalName $a Personal name Wickham, Madeleine. 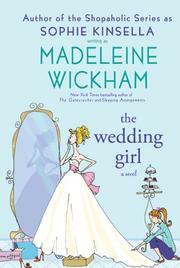 245 Title 4 $a Title The wedding girl. 520 Summary $a Summary, etc. note Twenty-eight-year-old Milly, preparing to marry the man of her dreams and trying to cope with family problems, worries that her day will be ruined by the revelation that she had married a homosexual man ten years earlier in order to help him stay in the country. 650 Subj:Topic $a Topical term Weddings--Planning--Fiction. 650 Subj:Topic $a Topical term Impediments to marriage--Fiction.